against Tarfa in favour of each of the five respondents. Apart from the EFCC and its Acting Chairman, Ibrahim Magu, the other respondents include Mrs. Rashidatou Abdou, Mr. Femi Falana (SAN) and MTN Nigeria Communications Limited. Benz SUV with Registration No. KJA 700 CG, were confiscated by the EFCC. respondents violated his right protected by Section 37 of the Constitution, when, without a court order, MTN allegedly made the call log on his mobile line, 08034600000 , available to the EFCC and the others respondents, who in turn allegedly released the information to Sahara Reporters and other online media. decision to withdraw the case however a source gave the information that the telecommunication giant, already encumbered with crisis, is considering the option of out of court settlement with the senior advocate in order not to add to its existing controversies. court, said they were not opposed to the withdrawal of the suit but urged the court to award a punitive cost against Tarfa. application was an ex parte application. 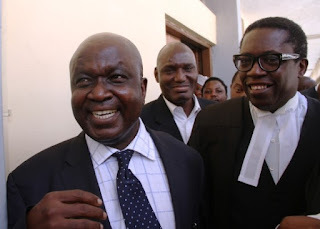 Besides, he said the respondents could not be demanding for cost because Tarfa had not served them with the suit. the suit and ordered Tarfa to pay a cost of N10, 000 to each of the respondents.